Although car accidents are a daily occurrence in the United States, people don’t typically leave their homes expecting to be involved in a collision on the road. When it does happen, the first few minutes after the accident can be jarring and a jumble of confused emotions. However, the moments following a car crash are also particularly vital, especially if you hope to pursue compensation for injuries or property damage. Following these 10 important steps immediately after an accident can help you protect yourself and your legal claim. Never drive away from the scene of an accident, even if the damage appears relatively minor. If you leave the scene of a car accident before the police arrive, you risk hit-and-run charges and stiff criminal penalties, regardless of whether the drivers or passengers in the other involved vehicles were seriously injured. Making sure that no one was seriously injured takes precedence over assessing any property damage. After checking yourself and your passengers for injuries, check the drivers and passengers in the involved vehicles for injuries, as well. Call an ambulance for any injuries that require medical attention, and make sure not to move people who are unconscious or complaining of neck or back pain. If you called 911 to report injuries, the police will be on the way. However, even if you believe there were no serious injuries, it's important to call California Highway Patrol to report the accident. A police report will be helpful in the event that you decide to pursue legal action and may be required by your insurance company. Make sure to call the police department's non-emergency line to keep 911 free for true emergencies. Once you've assessed any injuries and reported the accident to the police, take a minute to photograph the scene of the accident, if you can do so safely. Even if you don't happen to carry a camera in your vehicle, you can still document the scene using a cell phone or tablet—both usually equipped with a camera. It's also helpful to jot down the time of the accident, as well as current road and weather conditions. If it's safe to do so, move your vehicle to the side of the road, where it isn't blocking traffic. Turn on the vehicle's hazard blinkers, and if you have cones or warning triangles, set them up, or use flares to help prevent additional accidents. Write down the names, addresses and telephone numbers of drivers and passengers in each of the involved vehicles, and politely ask to see each driver's insurance information. Provide your contact information to the other drivers. It's also helpful to get contact information from any witnesses, so that you or your attorney can reach them in the future, if necessary. 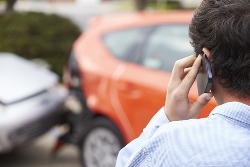 Report the accident to your insurance agent right away. Some insurance policies allow the company to deny your claim if you fail to report the accident immediately or refuse to cooperate in their investigation. After an accident, it can be tempting to apologize or try to place blame for what occurred. Resist the urge. Any statements you make may be used against you later and damage your legal claim. Even serious injuries sustained in an accident may not be immediately apparent, and many accident victims don't report feeling their injuries until a day or two later. It's best to seek medical attention as soon as possible, so that a qualified medical professional can treat and document any injuries. Consulting an experienced personal injury attorney can be very helpful to protect yourself after a car accident, particularly if you or someone else suffered serious injuries. Many attorneys who handle car accident cases work on contingency, meaning that you pay for their representation when you receive a settlement, rather than upfront. If you or a loved one suffered injuries in a car accident, an experienced personal injury attorney can help you pursue compensation for medical bills related to your injuries and property damage to your vehicle. Contact the knowledgeable legal team at the Inland Empire Law Group for a free, no-obligation evaluation of your case.